Lake Havasu City is a popular destination from the Phoenix area (and from Las Vegas, too) for people who want to enjoy the sun and the water, but who don't necessarily have the need for ocean beaches. The drive to Lake Havasu City from Phoenix, depending on where you start, will take between 3 and 4 hours. 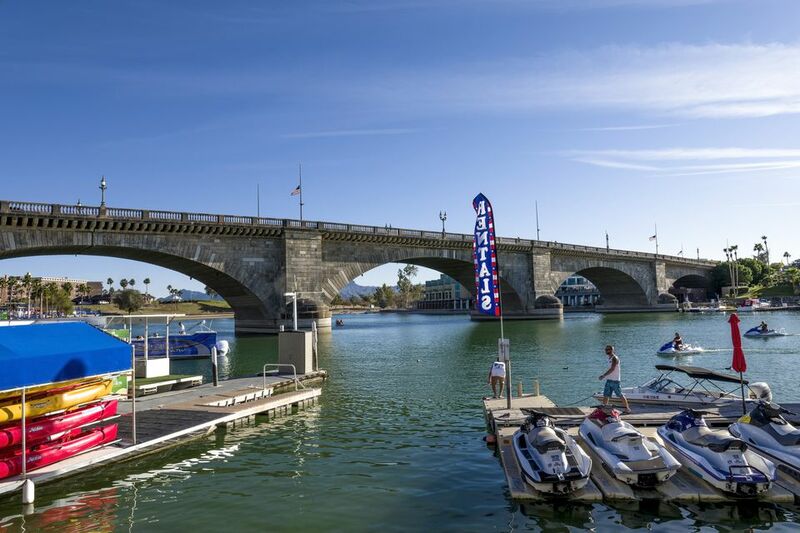 Lake Havasu City is the home of the famous London Bridge. This isn't a joke — the London Bridge was actually rebuilt over the Bridgewater Channel in Lake Havasu City, piece by piece, after it was dismantled from its previous position over the River Thames in London, England. The London Bridge attract visitors to Lake Havasu City from all over the world. Lake Havasu City is a year-round destination, known as the "Personal Watercraft Capital of the World." Lake Havasu City in located on Colorado River in northwest Arizona. Lake Havasu is about 45 miles long. In the summer the main attraction is, of course, Lake Havasu. Boating, para-sailing jet-skiing, water-skiing, fishing, canoeing, kayaking, and sailing are just some of the choices for people who love water sports. Boat rentals are available. In the fall, it is still warm enough to enjoy water-related activities. In the spring, Lake Havasu City is a very popular destination for Spring Break. If you don't enjoy being around crowds, or rowdy college students, I'd avoid Spring Break at Lake Havasu. On the other hand, if you are one of those rowdy college people, you can have a great time if you use common sense. More about that later. Along with the London Bridge there is a charming English Village and the London Arms Pub & Playhouse Theatre. A variety of tours on the water make a relaxing way to enjoy the beauty of the lake, the bridge, and the surrounding scenery. The Bill Williams Wildlife Refuge & Trail in nearby Parker, Arizona is a place for hunting, bird-watching and fishing. You can drive along the refuge for a great view of the area, and there's also a short nature trail that you can walk. For those of you that enjoy sports on wheels, there are plenty of opportunities to go four-wheeling and dirt biking. Driving a boat while under the influence of alcohol or drugs is dangerous and illegal. Wear sunscreen. Do you want to spend all but the first day of your vacation in pain? Drink lots of water. Heat exhaustion and heat stroke are no fun on vacation. Watch you alcohol intake, especially in the sun. Alcohol poisoning is about as much fun as heat stroke. Don't do anything you wouldn't want photographed and plastered on the front of the newspaper that gets delivered to your parents' home. Make sure that you and your family follows some simple steps to ensure that they don't fall victim to the Spring Break Scam (#4). Take I-10 West. Take Exit 19 marked Parker/Yuma to AZ 95 North. Continue on AZ 95 until you arrive in Lake Havasu City.